Haven’t got a churner at home? Not a problem!! 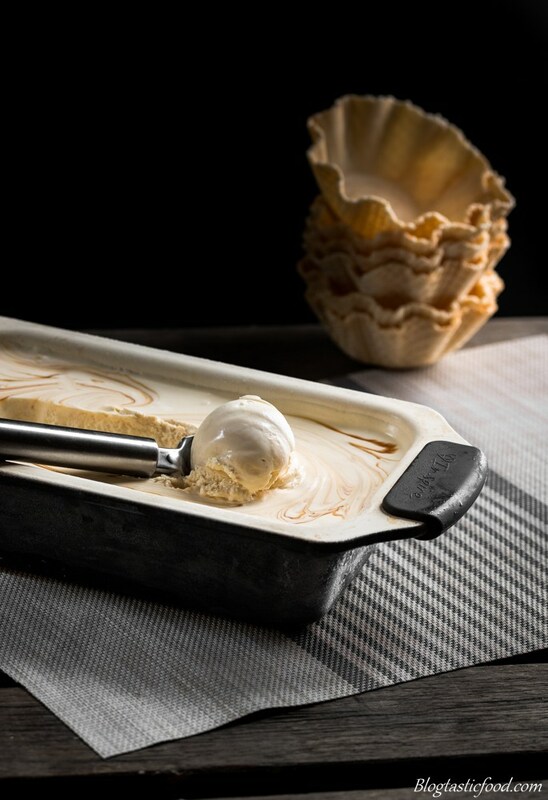 This salted caramel no churn ice-cream will rock your socks off!! And it is unbelievably easy to make. I honestly couldn’t believe how good this no-churn ice-cream actually is. All you need is sweetened condensed milk and whipping cream, and you’re ready to rock and roll. The Baileys and the salted caramel are just extra additions that I really like. Which means you can add whatever you want!! Although this particular recipe is amazing. There is no catch to this, you don’t need any fancy or expensive equipment. And I promise I am not lying when I say that it tastes just like legit, well-made ice-cream. Now, when you read the first step of the recipe, you’ll notice that I tell you to whip the cream when it’s super cold. Why? 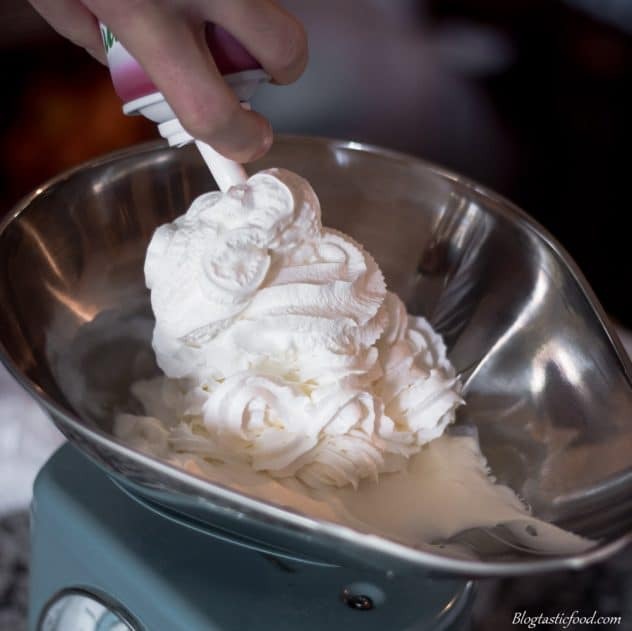 Well, when you whip cream that is taken straight from the refrigerator, you will get a result of greater volume and you’ll also end up with a smoother texture. So do not take the cream out of the fridge until you are ready to whip it and whip it good. I used to have a habit of over whipping cream and I didn’t even know it. So what is well-whipped cream and over-whipped cream? The texture of stiff peaks cream should hold it’s shape, but it should also be nice and smooth. 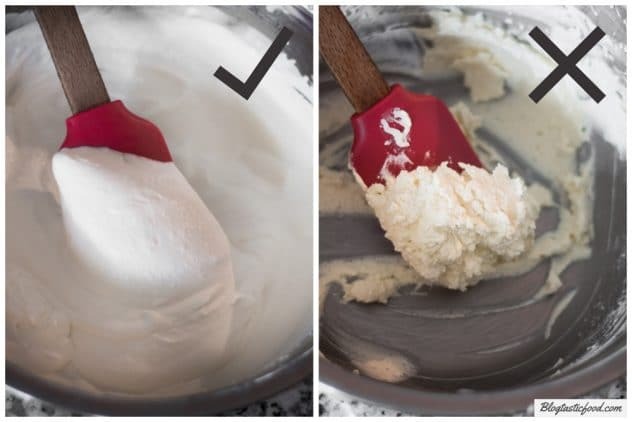 So make sure you are aware of how the cream changes consistency as you whisk it. And when it’s thickened to stiff peaks, STOP! Don’t be tempted to keep whipping it. That is how you end up over beating it, which means the cream will curdle and start turning into butter. 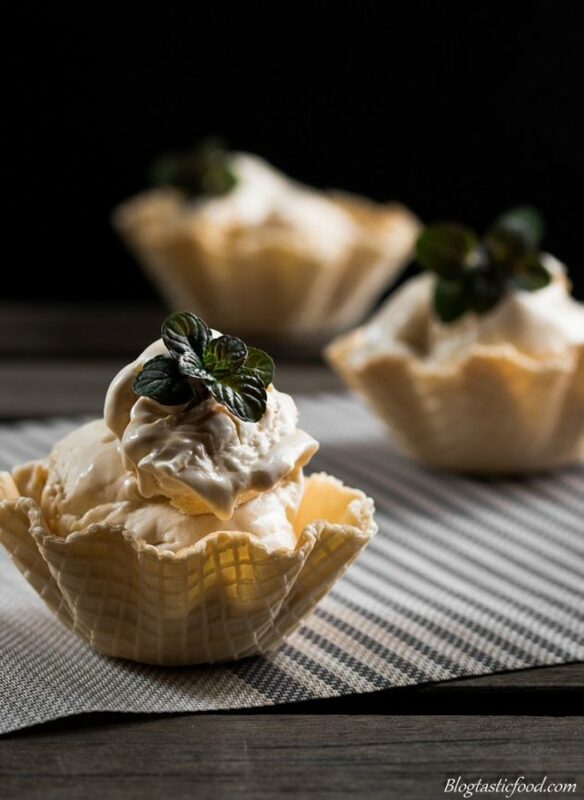 Here is the difference between stiff peaks and over-whipped cream. The idea of using cool whip was recently brought to my attention. So I tested it out myself and it worked just as well. In fact, I used it to make this jam-filled no churn ice-cream. Just use 475g of cool whip in place of regular cream. 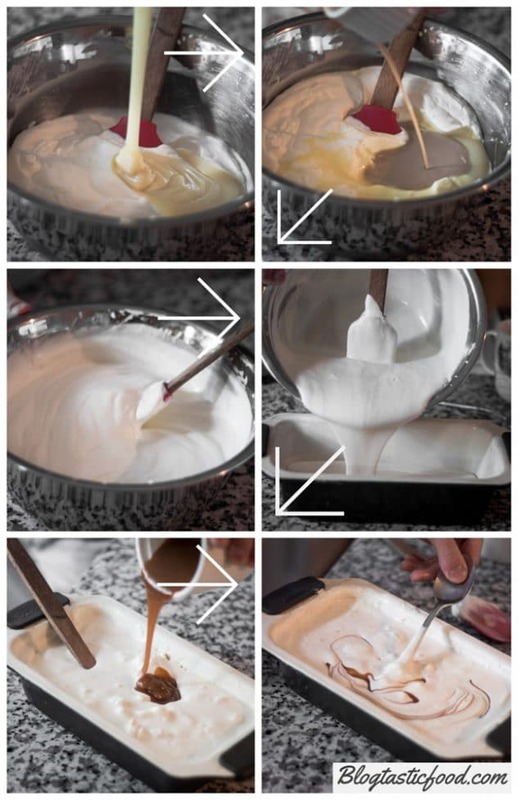 Although the cool whip is a pretty neat idea, I still prefer using regular whipping cream for 2 reasons. The first reason is that I had to buy multiple cans of cool whip in order to have enough and they were more expensive. Also, I am much more likely to use leftover cream than the leftover cool whip. This may not be the case for you but it’s just something to be aware of. Also, whipping cream ain’t that big of a deal. I actually prefer to use a hand whisk instead of the machine because you have more control. Something I learned in chef school. You could just mix the salted caramel through the ice-cream and it will add a nice flavour. However, I like the idea of rippling it through the ice-cream, making the swirl effect. Not just for decorative purposes, although it makes the ice-cream look awesome, but also because you get these little pockets of salted caramel. Which makes the ice-cream so much more satisfying to eat. This salted caramel no-churn ice-cream is stupidly easy to prepare and turns out wonderfully every time. Before you start whipping your cream, make sure it is really nice and cold straight from the fridge. Whisk the cream to stiff peaks, meaning that the cream is thick enough to hold it's shape but still has a nice, smooth texture (feel free to use an electric whisk). From there, add your sweetened condensed milk and baileys, then gently fold through with a wooden spoon or spatula. Drizzle your salted caramel over the top. Stick the back of your spoon/spatula in the ice-cream, and spend 20-30 seconds slowly and gently moving it around through the mixture. You will notice a ripple/swirl effect start to form. Transfer the mixture to a loaf tin. Put your ice-cream in the freezer, and freeze for at least 6 hours, preferably overnight. Have fun with this. As long as you have the cream and the condensed milk, you can add whatever else you want. So get creative and get kids involved. Be patient and give the ice-cream plenty of time to set. I’ll have to check out the berry cobbler. It looks delicious with your ice cream. And I love those little waffle cups you used for your solo no churn ice cream picture. No churn is very rich and decadent so you only need a very little to satisfy. Lots of flavour variations are possible as well. You’re only limited by your imagination in terms of add ins as well. 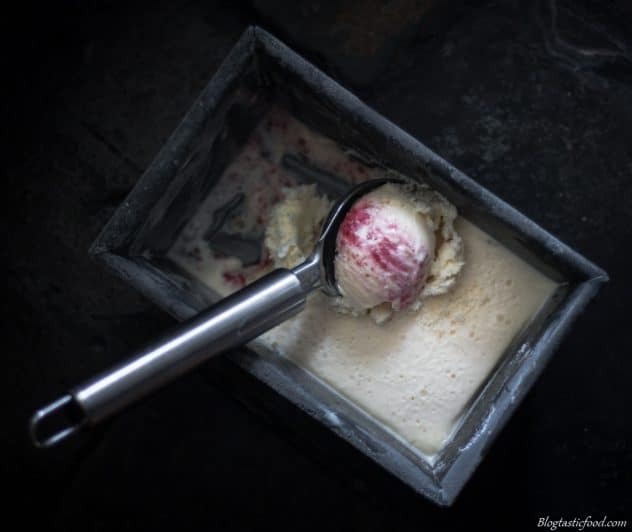 You caught my attention at “no churn!” The ice cream looks smooth and beautiful!! and it’s definitely ice cream weather around here!! thanks! 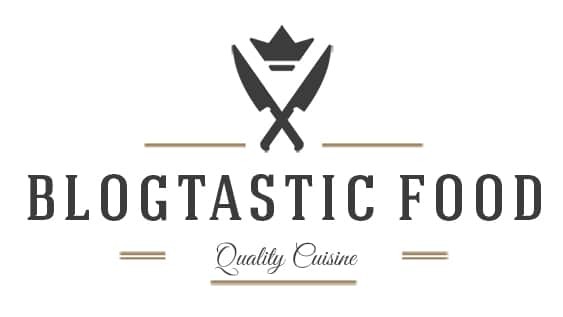 I loved your page and your recipes. I’ll definitely try it! Today I had plenty of time to prepare some stuff while waiting for hurricane Irma. I made this recipe with a small twist to keep the sugar down. Frozen cherries instead of caramel. I took the seeds off, puree them and place in a glass container. The good thing about placing the ingredients in a container is that now I just can made the little bit we are going to eat. My hubby loved it and so did I. It takes me now 5 minutes to prepare a treat. Thanks! Post so nourishing, appetizing; makes me feel hungry. 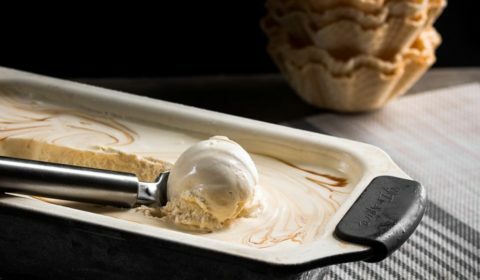 That is such a great combination of ingredients and I love the salted caramel taste with the sweet icecream combination. Great clicks. Love the idea of using cold cream, will definitely try it next time.